Here you’ll find Cozumel taxi rates to and from each cruise port. You’ll also find a hack to easily save 50% on your cab fare! The Cozumel Cruise Port at which you arrive will depend on the ship you’re sailing. All cruise vessels will dock on the west side of the island and within a relatively short distance of one another. The island is small, so all beaches, parks, and attractions are easily accessible via taxi. While some cruise excursions include transfer, many don’t. You’ll need to catch a cab or van. Below you’ll find Cozumel Cruise Port Taxi Rates for all major landmarks near port. At the end of the blog post, we reveal a cruise port hack to save you 50% on your Cozumel Taxi Rate! Seriously… no gimmicks or shadiness. One simple trick to save you a good chunk of change on your taxi ride to and from Cozumel Cruise Port. Cozumel has three main terminals servicing all cruise vessels. If you know yours, click below to jump forward to your specific cruise dock. If you don’t know the cruise terminal at which you’ll dock, it’s not a big deal. You can still get a good estimate of all Cozumel cruise port taxi rates from the tables below. The docks are close enough to where the differences won’t vary by more than a few dollars between those. 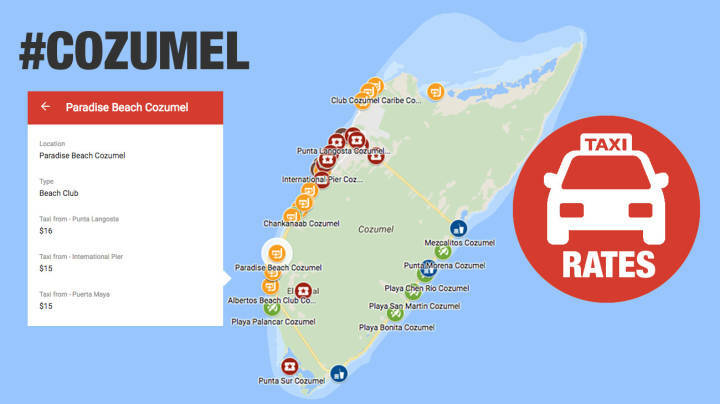 In this map, you’ll find the most popular things to do in Cozumel Cruise Port. Clicking on each will show you the taxi rates depending on your cruise port. NOTE: if planning an All-Inclusive Resort for the day, we have a much more comprehensive piece showing all costs, amenities, and attractions included in each. You’ll find that here – 9 Best Resort Day Pass Excursions in Cozumel. Or, if interested in exploring options other than resort day passes, you can find all Cozumel Excursion Options here. If you know the cruise port at which you’ll be arriving, you can find the exact costs based on passenger count. If your group is four passengers or less, you’ll find the far left column applicable. If you’re showing up with five people, you’re stuck in the awkward middle column. And, if traveling with a heard (more than five), check out the column to the right. Punta Langosta Cruise Terminal is within walking distance of Downtown San Miguel. There you’ll find plenty of options for shopping, drinking, dining and sightseeing. San Miguel is the largest city on the island of Cozumel. The cruise lines most often using Punta Langosta include Disney, Oceania, Norwegian Cruise Line, Silversea, Regent and Crystal. If you’re sailing any of these into Cozumel, it’s likely that this will be your dock. Below you’ll find taxi rates to the most popular beaches, parks and attractions from Punta Langosta Pier. International Pier is also referred to as “SSA Mexico.” The dock is a few miles southwest of Downtown San Miguel and Punta Langosta cruise dock. If you’re sailing either Royal Caribbean or Celebrity, it’s more than likely that you’ll arrive here at SSA Mexico. The pier also hosts cargo vessels and is integral in Cozumel’s importing and exporting abilities. International Pier is located very close to Puerta Maya terminal. If looking for your closest shopping and dining options, Puerta Maya offers an array of commercial options. You’ll probably be headed out to explore one of Cozumel’s many shore excursion options. If your tour requires that you provide your own transportation, you’ll want to know associated costs. Below are van and taxi rates leaving from International pier and going to the most popular things to do while in Cozumel. Puerta Maya Cruise Terminal is the newest and prettiest of all of Cozumel’s cruise ship docks. It was built with Carnival’s collaboration and hosts most of the ships coming in under Carnival’s flag. If you’re sailing any of Carnival’s other owned brands (Princess, Cunard, Costa, P&O, AIDA, Holland America, Seabourn) then you’ll likely be docking here as well. The terminal itself provides a number of options for shopping, dining, and entertainment. As an example, you’ll find Diamonds International, Dufry, Piranha Joes, and Tres Amigos restaurant. Try not to get caught up in the excitement at Puerta Maya Pier. There’s plenty more exciting things to do while in Cozumel. Below is a list of things to see and the associated taxi costs from Puerta Maya Terminal. And now as promised, our cruise cab hack. Sound too good to be true? It’s not. It’s super easy to do. Here’s the hack to save you 50% on your taxi. Most of us cruise with one other person. Cozumel taxis charge by the car-load, rather than by the person. Many passengers are heading to the same place. Find another couple that’s going to the same place and share a taxi. Not only is it a great way to make friends, it’ll save you roughly $20 to and from your excursion destination. Make sure to arrange this in advance of the taxi stand. Otherwise, the cab drivers will give you a hard time. We hope that the information above helps you best choose your cruise excursion. When looking at shore tour options, make sure to check whether transfer is included. If comparing between two options with and without transfers, make sure to utilize the taxi rate chart here. It might be worth spending a bit more on an excursion with transfer than without!